I miss the old Boracay where roads weren’t congested, and where passageways going to the beach weren’t jam-packed. I’m all for boosting the isle’s tourism and progression. But it was a bit of an eyesore to see so many construction sites sprouting up like mushrooms. I had a hard time recognizing certain areas that were so familiar before that I felt somewhat confined. It wasn’t the island vibe that I was longing to experience, as sceneries have definitely changed since I visited 3 years ago. So imagine how refreshing it was to stay on the same islet but on a more quieter and calmer side of it. Given all of the major changes in the bustling side of Stations 1-3, I’m glad I found Savoy Hotel in Newcoast Boracay. You’d be surprised that such a place existed just 30 minutes away from D’Mall in Station 2. The well-traveled Dr. Andrew L. Tan, Megaworld Corporation’s CEO, and chairman named the hotel after a place in France (Savoy is a cultural region in Western Europe). Given his admiration for the country, he also named certain outlets of the hotel after some towns in France like CHAMBERY Pool Bar and VIENNE Lobby Lounge. LILA Spa, which is French for purple, is also set to open this coming November. Savoy Hotel, which has 559 rooms, is a tourism estate by Global-Estate Resorts Inc. (developed by Megaworld Corporation). Master-planned and situated in a ‘community within a community’, Savoy is located in a 150-hectare township that includes a combination of tourism, residential, and retail (24 spaces that front the party pool are set to open before the year ends). Apart from being the first hotel to have a concert pool arena in Boracay (a 4-feet wading party pool with a 200 to 300 pax capacity), Savoy also has its own restaurant, fitness center, ballroom, and meeting rooms. They also have their own private shoreline, the Newcoast Beach, which is a nice 10-minute walk from the hotel. A kilometer stretch divided into 3 coves, Boracay Newcoast Beach offers a more quiet side of the island (open from 6 AM to 6 PM). *A free shuttle service to the seaside can be requested at the front desk. It was already late in the afternoon when we arrived in Boracay. Good thing, the contact persons from Savoy extended their patience when it came to our final pick-up time. Soon enough, we were escorted into a white shuttle van where we were instantly treated like VIPs. Everything was simply commendable, from being courteously greeted at the meet-up point to being warmly welcomed at the hotel. That’s world-class service right there. The hotel was a 30-minute drive from Station 2 (factor in a little bit of the traffic). You’ll know that you’re about 10 minutes away from Savoy Hotel when you finally see CityMall. The Newcoast Boracay community exuded a peaceful and quiet setting. The roads were clearer, the air was cooler, and the trees were fuller. It was like we were transported to a different time and place. NOTE: Free hourly shuttles to and fro Station 2 are offered from 9 AM until midnight. 12:25 AM is the last service going back to the hotel. The first thing that I noticed upon arriving at Savoy was its brilliant colors: green, magenta, aqua and purple. With its subtly vibrant tones, the six-story hotel looked chic, young and modern, that entering the grounds felt invigorating despite arriving late in the evening. The luxury establishment certainly lives up to its tagline, ‘color your experience’. I also loved the fact that as soon as we got off the van, we were immediately offered a cold juice drink, a fresh towel and a warm welcome from Sir AJ and his team. Our beautifully-fitted Deluxe Twin Room, which is good for 2 pax only, was specially arranged for our specific capacity. As a group of three, Savoy was able to cater to our needs by placing an extra mattress inside the room. Our space may have looked like there was little room for movement. Surprisingly, we didn't feel cramped up. If you’ve been a regular reader of my blog, then you know that I love staying in hotels. For me, Savoy Hotel was beyond my expectations. There was a ‘wow’ factor upon entering our Deluxe Twin, especially with the addition of a spacious balcony that offered a view of the pools. Even the paintings and the lights were summery and cozy, which helped project a pleasantly beachy vibe. I also loved the bed that I slept in, as it was soft yet firm. It had spotless, white sheets, and a thick duvet that kept me warm all night. My friends and I also felt a lot more special after seeing the sweet treats that were left in our room (a locally-made native bag, a box of cookies and a plate of macarons in Savoy’s colors), along with a personally signed card from Savoy’s General Manager, Sir Adie. Talk about going the extra mile, right? There's plenty to praise about our humble abode. I loved that there was enough space to store our bags and that we were provided with our own bathrobes and slippers. The bathroom was also cozy and was fitted with complimentary toiletries and towels. We also liked that there were plenty of electrical sockets, and were left impressed after seeing a USB Charging Socket on sight (no more adapter needed!). I was fortunate enough to have been given a personal tour of the rooms in Savoy Hotel. Given that we were staying in a Deluxe Twin, Sir AJ was able to show me what our room looked like without the extra mattress. I also got to see the *Premiere Deluxe (good for 2 pax), *Executive Suite (family of 4), Deluxe Queen (good for 2 pax), and Corner Deluxe (twin, good for 2 pax). I loved all of the spaces. But I was more enamored with the Executive Suite and the Corner Deluxe, as these chambers offered gorgeous views of the beach. *Rooms that come with a complimentary native bag, pastries, and slippers. The Executive Suite also provides free coffee capsules, noodles, and bottled juice drinks. Guests are provided with complimentary buffet breakfast for two at Savoy Café, complimentary wireless Internet access in rooms and public areas, use of recreational facilities (gym, pool, non-motorized water sports activities), as well as complimentary scheduled shuttle service to D’Mall in Station 2. Room amenities also include coffee and tea making facilities, a 32” LED TV for Deluxe Rooms, 42” LED TV for Premiere Rooms and Executive Suites, In-room personal safe, refrigerator, telephone, hairdryer, bathrobe and slippers, laundry bag, notepad and pen, and complete bathroom amenities. NOTE: Savoy Hotel also has 8 PWD-friendly rooms. There are a lot of facilities in the hotel that are free to use, that you’ll never run out of things to do in the area. But one of the amenities that I really loved was the pools. I was able to take a dip on our last night in the hotel and was surprised that the water was warm. The air was a bit chilly, so I had a pleasant time just staying in the water. Apart from the main pool, it also has a separate party pool, Children’s pool, paved sunbathing lounge, in-water lounge, Pavilion pool bar, cabanas, and wet bar. Savoy Hotel also has its own spa, fitness center with shower and changing rooms, full-time concierge, transport facilities, meetings rooms and function rooms. The hotel also has its own escalator. Savoy Hotel has three dining outlets: Savoy Café, Chambery Pool Bar, and Vienne, Lobby Lounge. Savoy Café, which offers a contemporary cuisine, is open from 6 AM to 11 PM. It can accommodate around 150 people inside, and 98 more by the pool area. 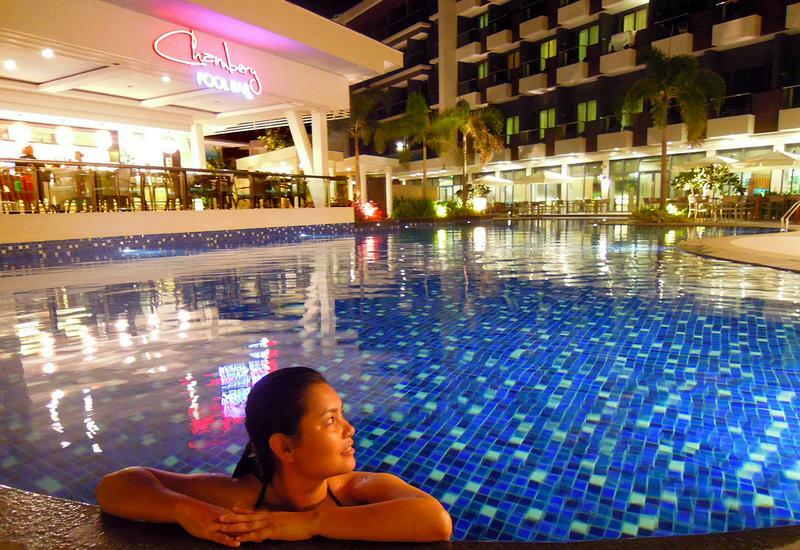 Chambery Pool Bar, which is fixed by the main swimming pool, can seat up to 30 diners (open from 10 AM to 11 PM). Vienne, on the other hand, can seat up to 85 guests (open from 9 AM to 12 AM). For a more detailed food review, click HERE. Everyone in the hotel was pleasantly-nice and very accommodating. I would call for assistance, and help would come just as fast. I enjoyed having meaningful conversations with some of the hotel staff like Kuya Alexis, the waiter at Savoy Café, who shared some of his interesting life stories while working abroad. I also had a nice chat with Sir Aeron, the Assistant FB Manager at Savoy Café, as we talked about our shared love for travel. I also got to meet Ate Chery-An (P.A. ), who willingly showed me where the meeting rooms were, and where the gym was located. Sir Lester, who coordinated our pick-up at Budget Mart, was also efficient and always on his toes. I also had a good talk with Sir AJ, who also shared the same passion for travel. Lastly, I enjoyed our meeting with Sir Adie, the General Manager of Savoy, who generously shared his time with us despite having a busy schedule. All in all, our stay in Savoy Hotel was truly relaxing. It was a great way to end my week-long trip in Panay.